This will get some attention at any British auto show... This is a 1958 Triumph 10. In most of the world it was known as the Standard 10 (Triumph being part of the Standard-Triumph company back then.) Standard was an unknown brand in North America, so it was badged a Triumph. The 10, believe it or not, was an upmarket version of the Standard 8. The 10 had "luxuries" such as roll down windows (as opposed to sliders) and an externally accessible trunk (boot, in England). This was not a sports sedan by any measure. The engine is a 948cc 4, which gets it to 60 MPH in about 18 seconds. Top speed was in the 70 MPH neighborhood. In total, just under 17,000 Triumph badged 10s were produced. It can be assumed that most of those came to North America. There are very few left. This car has had plenty of mechanical work done to it. 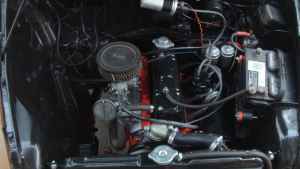 The seller rebuilt the engine and carb and replaced things such as the fuel pump and starter. It is mechanically sound. There are a few things that worry me about this car. These cars rusted badly. While this is a California car, it appears to have been repainted as I don't recall ever seeing or reading about any that came with that style of two-tone paint. 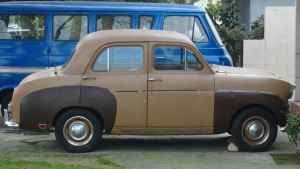 (They often did come two-tone, but the colors were split at the side trim - one color on top, the other on the bottom.) That paint job could be hiding a ton of evil. The rear door panels have modern speaker in them. 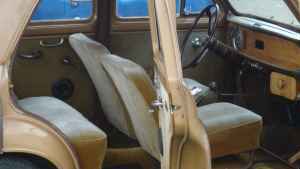 If you want to bring the car back to its original state, it might take you awhile to find decent replacement door panels. This is not an exciting British car. It's not particularly stylish (although it's a lot better looking than the Mayflower it replaced in Triumph's lineup) and it's not all that fun to drive. It is however a piece of Triumph history and a very rare car these days. If it's not a rust bucket, it deserves to be restored. For more Standard / Triumph 10 pictures and info, check out the Standard Motor Club website. You can find it here. Mine's a 59. I don't think they ever came painted that way; you're right, it's a one-off. I like the speaker mount location though, I've been trying to figure out how I'm going to put a stereo in mine.